Hout Bay 50 "Cape Rose"
The first version of this yacht was the excursion schooner, with a 40 to 50 passenger capacity depending on licencing authority. It was drawn with a traditional appearance to bring to mind tall ships and salty adventures and attract people to a first sailing experience. Below the water she was given a modern underbody for good performance and manoeuvreability in tight harbours. She proved to be seaworthy, comfortable and a good boat on all points of sail. Her combination of traditional gaff rig and modern underbody gave her performance and helm response which surprise most who sail on her. 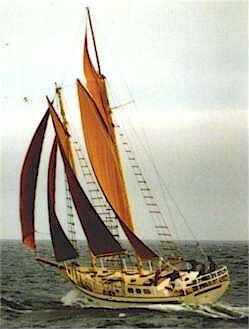 She is a good reaching boat but, unlike many gaff riggers, she is powerful to windward as well. It is not necessary to crank up the engine to get off a lee shore. This is a very stable and seaworthy design, with excursion boats built to these plans carrying passengers in almost all wind and sea conditions. The wind speed at which they stop operating is 50 knots. From this was developed the cruising version with trunk cabin and aft cockpit. It has a very comfortable interior, with four double cabins and large open living areas designed around a central engine position. "Cape Rose", the first of these boats, once covered 1200 miles in 6 days under sail, phenomenal for a steel cruiser. The poop deck and pilothouse semi-cargo version was drawn for a 3-owner consortium who each wanted a private en-suite cabin along with pilothouse and cargo space convertible to additional accommodation. It was given a double topmast rig for power to move the increased weight due to cargo and more structure aft. The cargo space has a large cargo hatch opening up almost the entire cabintop and a smaller skylight hatch for loading smaller items. Powering can be either single or twin engines under the pilothouse sole. Maximum cargo weight is 10 tonnes. For a dedicated cargo carrier concept with 25 tonnes capacity see the Cargo 50. The semi-cargo version is also available with marconi staysail schooner rig, giving easier handling. A non-cargo cruising interior with three double cabins has also been drawn, featuring a large owner's cabin under the poop deck. Hull construction is of multi-chine steel for ease and speed of construction but with the topside chine radiused in section so that she has the appearance of a round bilge boat when on the water. She has a long fin keel and a substantial skeg and rudder well aft. Ballast is all lead or 50/50 lead and scrap steel and is placed at the bottom of the keel with tankage above. For the DIY builder with a smallish budget, the gaff rig will be the least costly. Expensive hardware is kept to a minimum and muscle is applied to halliards by means of tackles rather than winches, using hand made wood faced blocks. Galvanised rigging is used for the gaff rig versions, further reducing costs. The marconi rig uses stainless steel rigging and more harware. This design provides the timeless appeal and value of a traditional yacht combined with the space benefits of a modern interior and the handling improvements of a modern underbody. It provides a yacht well able to carry her crew in comfort and safety in all conditions. For a smaller design in this concept, see the Hout Bay 40. Follow these links to a material list for the structure of the cruising version, a stability graph and a list of drawings for this design.